Already have (or prefer to use) one of AbleNet’s mounting systems with your iPad, iPhone, or iPod Touch? Now you can! 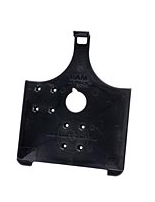 We have mounting plates and cradles available for our Latitude, UMS, and Gooseneck mounting systems while giving you access to all of the device controls and jacks. AbleNet does not cover damage caused to an iPad, iPhone, iPod, or other consumer electronic devices used in conjunction with any product manufactured by or distributed by AbleNet. For full warranty details visit http://www.ablenetinc.com/Support/Warranty-Info.